Of the two dozen meals I had all around the town this past week, the best thing I ate anywhere was the scallops at Patio, hands down. This dish was the special that day, and I hope to find it on the menu again sometime. Each day Patio features the freshest, the most beautiful, the most succulent... whatever is the very best seafood, meat, poultry, vegetables or herbs that become available each day will inspire chef Crittendon Bliss to create a new dish to offer along with the varied choices of his regular menu. When owner Joachim Sandbichler, fishing on a rare day off last summer, landed a beautiful Striped Bass, it became a special on the menu that evening, just hours out of the water. This night I was wanting something vegetarian but I couldn't resist ordering the special once I heard the waiter describe it: pan seared PTown scallops, Baby Gem Lettuce (kind of a cross between Romaine and Buttercup) sautéed with bacon and shallots. The pan must have been smokin' hot when the scallops went in because they got a nice, crusty caramelization but stayed perfectly tender and succulent inside. The Pan was deglazed with a sherry-tomato-caper vinaigrette, and the dish was finished with a Lemon Beurre Blanc drizzled on the plate. This was the most miraculous combination of flavors and textures I tasted this past week. The tender sweetness of the scallops paired with the very slight bitterness of the lettuce, which has a firm texture a bit like flawlessly cooked leaves of Brussels Sprouts, was a stellar combination, and when you add in a bit of acidity from the vinaigrette along with the velvety creaminess of the Beurre Blanc, this dish was perfection on a plate. By the way, Patio's wine list will take you from Austria to South Africa, and from California's Napa Valley to the Loire Valley in France. There are bottles from Italy, Spain, Chile, and Australia, and three sparkling wines, with a dozen wines also available by the glass. Patio offers more than two dozen signature Mojitos and specialty cocktails, like the White Peach or the Black Raspberry, two of my favorite Mojitos. Try the Chili Passionfruit Martini. That's Skyy vodka with the flavors of passion fruit, orange juice and cranberry with a few flakes of chili pepper, and it's really, really good. Since I had already decided not to drink this particular night, I had a mocktail instead. I had the Wild Passions, made with passion fruit, of course, and lemon, lime, cranberry and a splash of soda, served with a fruit garnish; all the fun of a cocktail but without the booze. Desserts are all made in-house and have been known to include classic favorites like Strawberry Shortcake, Key Lime Pie, Tiramisu, Creme Brûlée and many others. Check for nightly selections at the whim of the chef. So if you haven't tried Patio, it's high time; this is their eighth season. 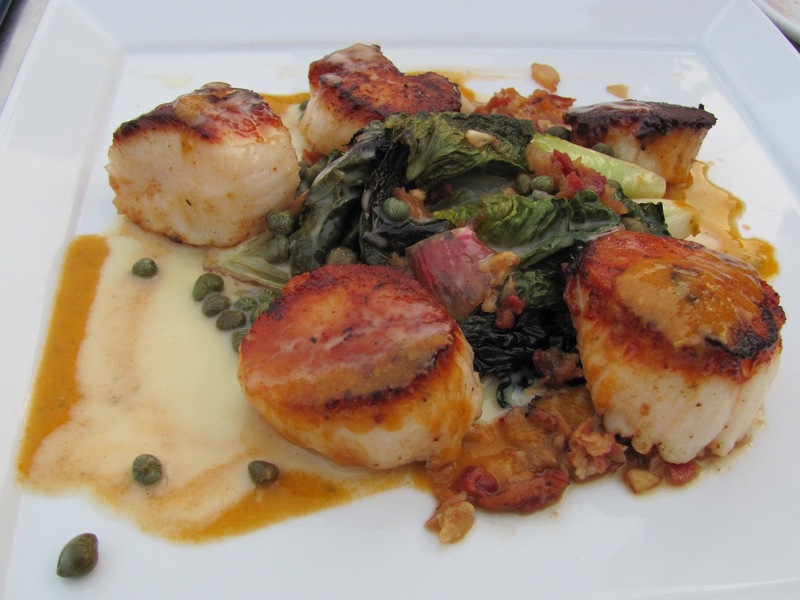 The YearRounder names this wonderful scallop dish as a Best Bite. You'll find Patio at 328 Commercial Street. You can't miss it. It's the big open-air patio next to the old Public Library at the corner of Freeman Street. Reservations are accepted. Phone Patio at 508 487-4003.